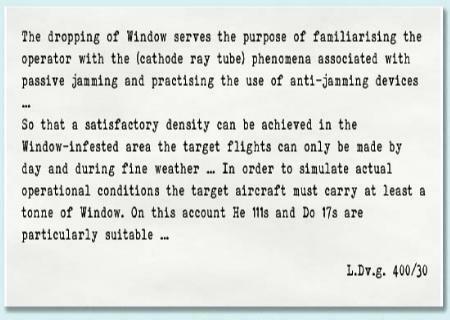 Rasch makes it clear that only one airborne jammer was then available, »Kettenhund«, that it was effective only in the 1.20–1.80 cm waveband (the British ASV Mk. II radar operated on 1.70 m) and was not being used on operations because the transmitter could act as a beacon to hostile aeroplanes and could interfere with the search and detection capabilities of the machine carrying it. There was currently no centimetre-wavelength jammer (to counter, for example, ASV Mk. III on 10 cm) while the set under development, »Roderich«, was clearly disappointing. NOTE: Roderich had suffered a difficult gestation. It came in two models: continuous wave (»Roderich D«) and pulsed (»Roderich I«). By June 1943 the first “D” model had been built and tested against a captured H2S set on the ground, trials against an airborne set were to follow within days. A month later, Dr. Schultes of the Siemens & Halske company reported that development had concluded and that 300 sets per month could be expected from October—with the rather important proviso that the necessary valves were still not available. By 2 September however the production schedule had already been put back and then the Sanitas plant which made the crucial LMS 10 valves was obliterated in an air raid. Telefunken was able to take up the reins temporarily but only at the rate of five per month. Trials meanwhile had demonstrated that the jammer’s effectiveness against H2S was heavily range-dependent (at 3 km a 30º sector was affected). On 22 October, after further testing of the prototype, Siemens’ Dr. Wermann gave a more pessimistic assessment. The current state of development could not guarantee effective jamming since adjusting the sensitivity of the H2S receiver allowed the radar picture to be recognised on the scope. Further development was absolutely necessary. When the working group reconvened in December, Flieger-Hauptingenieur Huschka gave the evaluation of the initial trials flights by the Plenipotentiary for High-Frequency Research: these indicated that the target of a 50-Watt continuous wave output was far from adequate. Schultes reported that there was a serious shortfall of valves as well. Between them, Schultz and Rasch offer perhaps the best available picture of what Horch- und Störstaffel 2’s activities actually were, as well as clues to what it had not been doing. Intermittent sorties by one or two aircraft could never have interfered significantly with Allied radars over an area so large as the Bay of Biscay (c. 550 km North–South and 650 km East–West) although it is of course possible that individual jamming trials were carried out. Any local jamming support for, say, a returning U-boat would have been compromised by the “beacon effect” mentioned above; a lone aircraft could however be very valuable listening-in on Allied radars and communications during anti-submarine operations. Monitoring electronic emanations was a well-established form of intelligence although in this case it seems that little of significance had been learned despite many months of operations. The intention on 1 March was that 9U+CB should start from Mérignac at 2215 and return from 0600–0700. Apart from the marginally earlier landing time this mission profile duplicated the previous night’s, right down to the route (Mérignac – 24 West 3951–15 West 9053 – Mérignac) which may be a further indication that the original flight had not in fact taken place. 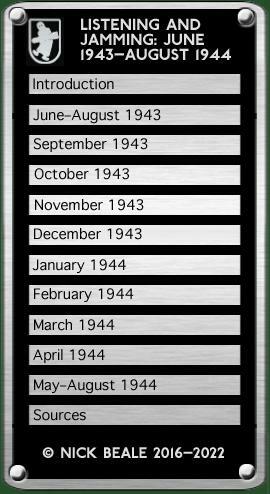 At 2230 on the 3rd, the Luftwaffe issued “data for operation of Horch- und Störstaffel 2”: He 111 9U+CB had started 20 minutes earlier and was due to return between 0610 and 0710 but nothing was heard by the Y-Service. Again two destroyers, Z 23 and ZH 1 were notified and the aircraft was to transmit “858” if “ship targets” were located. Although passive jamming was involved, it is far from certain that this was a Horch- und Störstaffel operation since “target representation” was a role normally undertaken by those elements of Fliegerzielgeschwader 2 based in France. The radar set can be jammed, since autumn 1943 however we have obviously made no use of this possibility.